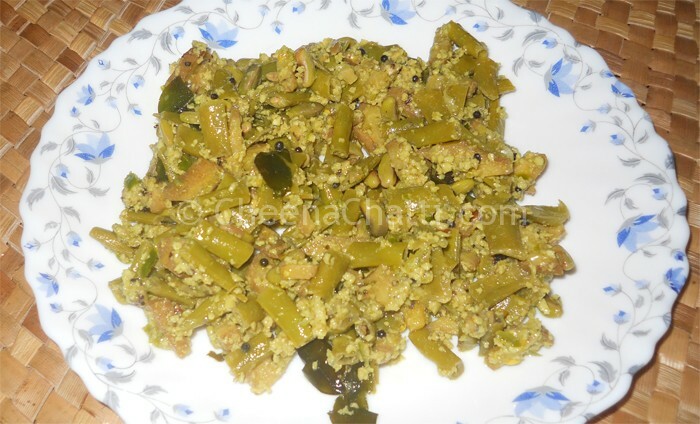 Thoran is a very popular and common Kerala dry dish traditionally made of finely chopped vegetables (any vegetable of choice) such as bitter-gourd, unripe jack fruit, cabbage or leaves such as green or red cheera, Moringa etc. These chopped vegetables are mixed with grated coconut, mustard seeds, curry leaves and turmeric powder and briefly stirred on a pan over a very hot fire. Thoran is usually served along with steamed rice. Following recipe is for preparation of Payar (Long yard beans) and ethakka (Raw plantain) thoran (stir fry). Let me know your comments or thoughts after trying this. Peel the plantain and chop it into small cubes. Chop the long yard bean also. Cook the sliced plantain and the beans together with half cup water, salt and turmeric powder in a pan. Mix the grated coconut, green chillies,shallots to a coarse form in a mixer (optional red chillies too) . When the plantain and beans are cooked add the ingredients in the mixer to the pan and saute. Cover the pan and cook on medium heat and saute in between. In another pan add oil, splutter mustard seeds and curry leaves and saute. Transfer the cooked ingredients (#4) to the second pan (#5) and cook till the plantain become soft. Serve hot with rice and curd. This entry was added on July 26th, 2013 by Jameela Beevi in Vegan and tagged with long yard beans curry, kerala thoran, payar thoran, long yard beans recipe, vegetarian, kaya thoran, pachakkaya thoran, yard long beans recipe, thoran. Last revised on April 4th, 2018.